It’s been spring in Florida since…February, basically…so I was so excited when Merideth’s true seasonal weather cleared up and we could do this Farmer’s Market challenge! There is a wonderful farmer’s market near where she and I went to college, so it felt extra fun to go revisit it for our post! Dragging my dog around the market (she had to sniff everything) was a fun experience and I definitely think I’ll be going back for fresh ingredients and the great community vibe. Merideth and I set the ground rules that our dishes had to be made from the ingredients at the farmer’s market plus three home ingredients, salt, and pepper. After lots of wandering following the dog, I finally settled on some Brussels sprouts, spring onions, and cucumber. I had a steak at home and some butter and garlic to round out the menu. Not knowing how to incorporate the cucumber, I just ate it. 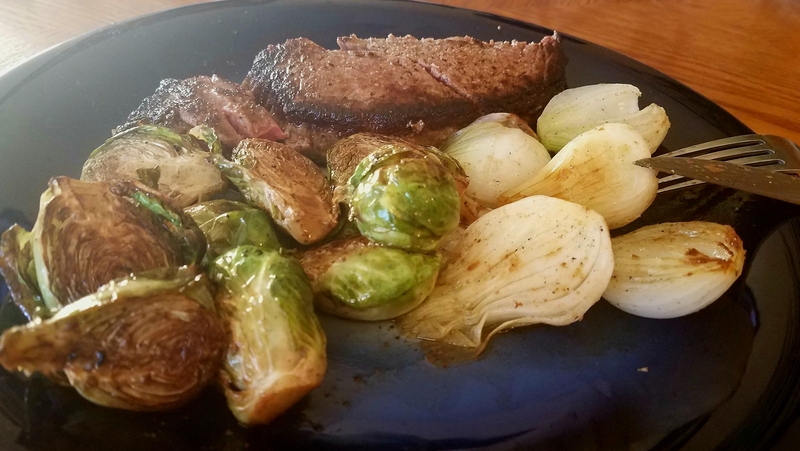 Being limited by ingredients pushed me to think more carefully about the preparation to impart extra flavor and, consequently, I decided to use my favorite technique: the one pan meal. Ingredients are added one after the other, so prepare the veggies and steak first to decrease total cooking time. Melt 2tbs butter over medium heat in a cast iron pan, and add minced garlic. 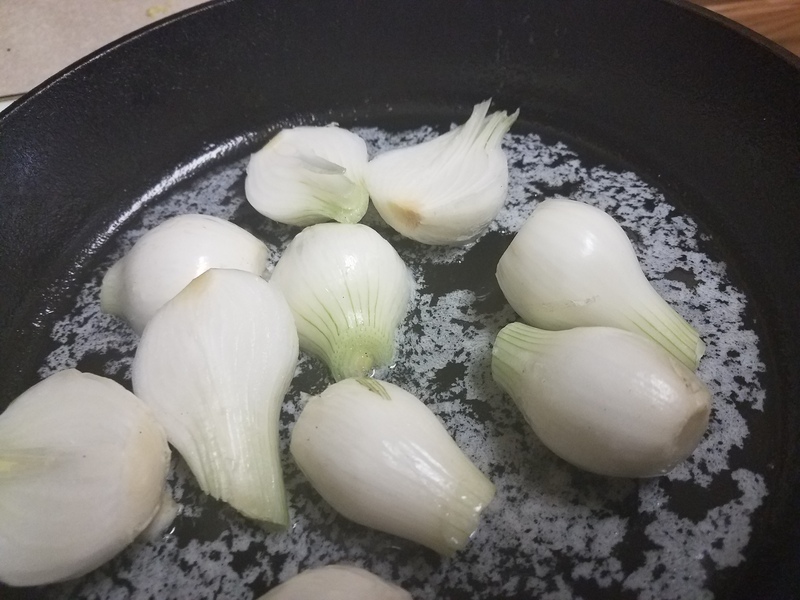 Saute onions in butter, turning occasionally, under tender (about 6-8 minutes). Remove onions and place in covered bowl. Season halved Brussels sprouts with salt and pepper. Melt additional tbs butter in pan, or as needed to cover bottom of pan. Add Brussels sprouts to pan and sear for 3 minutes. Turn and sear for an additional 4 minutes, or until tender. Remove sprouts and add to bowl with onions to keep warm. Pat steak dry and season with salt and pepper. Lay steak away from you in the pan to avoid burns from the hot butter. Using tongs, pick up steak after 3 minutes and hold fatty sides of steak again for about 10-15 seconds the pan to render the fat. Lay steak on opposite side and cook until desired doneness (I left it for another 2-3 minutes for medium rare. With about a minute left, add onions and Brussels sprouts to reheat and infuse flavor. Transfer contents to a plate and enjoy! Wine Pairing: Because of the steak, char from the cast iron pan, and the simple seasoning of salt and pepper, this dish is good with a full-flavored red wine like cabernet. I had a local wine to go with the locally sourced vegetables!